It is important to note livwscore that we are focusing not only on the tournaments of the Grand Slam series, but also on many other competitions, so that you won’t miss anything important and have the most detailed picture of the game day. Thus, broadcasts of tennis matches are very popular among users. And it concerns both major competitions and local tournaments. This is an extra evidence that this sport is now on the rise and the season 2019 plans to end up being far more exciting. Storm staffer Pete Weber won two matches en route to his first career European Bowling Tour title in the 30th Trofeu Internacional Ciutat de Barcelona at Bowling Pedralbes in Barcelona, Spain, July 22-27. The PBA Hall of Famer, who had back-to-back 300 games in qualifying topped No. 3 seeded Nicole Sanders, Netherlands, 236-211 in the semifinal and went on to defeat No. 1 seeded Paul Moor 214-211 in the championship match. Weber qualified second behind fellow PBA star Sean Rash to make the top 48 before eventually making the top 24 cut, Weber in 7th and Sean in 12th. The field then bowled four more games of qualifying to determine the top three for T.V. Weber qualified second behind Moor and ahead of Sanders. “Whether it was San Marino or Barcelona, I used three different Storm Dimension, said Weber. “First, in San Marino, I used two different ones. The first day when I arrived in San Marino, I bowled with a pin up, extra hole 6" from middle of span, which is my favorite layout, and bowled 1575 for 6 games of qualifying." “I noticed during the qualifying rounds the lanes becoming more tighter. I then asked Peter Somoff to drill a new Dimension with the pin in the middle of span and the extra hole down 1/4" from axis point. First squad of match play I shot 258 and 279. Next match I barely made it through by 5 pins. Then I lost in the round of four to Thomas Gross, who was also using a Dimension or Rapid Fire." 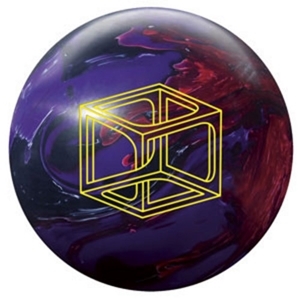 “All in all, the Dimension is one of the best balls I have ever used. It is very easy to see the ball roll/react down the lane with the layouts I used giving me the reactions I want to see. I saw a lot of the foreigners using the Dimension or some sort of Storm equipment." “Now onto Barcelona. My first squad I didn’t bowl so well. I used a pin up Dimension. Each pair was reacting differently. I couldn’t quite read the ball going down the lane. Second squad, I used pin down, just under my fingers, with extra hole 6" from middle of span. First game 164. Then I decided to change hand positions because I knew there was a way to get this ball to react. All of sudden I’m reading the ball down lane. After 4 games I was 200 over with back-to-back 300s. After the six game block I was 220 over." “On Sunday, more qualifying games. First 4 games, 855, qualified 7th. The next four games I had 935, qualified 2nd for the t.v. show. Only two practices balls on t.v. then the games starts. I moved right to play between the first and second arrows and threw the Dimension as hard as I could keeping the ball in play. It just proves that you can make the Dimension hit going straight or hooking the lane. And then on to a VICTORY!" “I had a wonderful experience with our Staff and Mr. and Mrs. Chrisman and everyone involved with the European Bowlers Tour. It was a honor and a pleasure to represent Storm." Weber earned 12.000 Euro or approximately $18,850 for first place and moved up into a 16th place tie in the 2008 European Bowling Tour (EBT) rankings.